The Diet Dropout’s Guide to Natural Weight Loss was created by Stan Spencer, PhD, a blogger and former research scientist. This is not a diet book, but instead, is about creating a personalized weight loss plan. You will learn to make permanent changes in your eating and exercise habits! This method helps you find the easiest path to becoming naturally thin and effortlessly achieving your weight loss goals. Most diets fail in the long run because they are hard to follow for any length of time. Dieting can be unpleasant, boring, inconvenient, and expensive. On top of this in most cases you gain weight again when you resume normal eating. Stan Spencer is offering an alternative that focuses on changing your lifestyle for a permanent weight loss solution. It may take longer to get results but ultimately you will be rewarded as it becomes effortless to maintain your ideal weight. These foods are high in fiber so they digest slowly and keep you satisfied for longer. This ratio helps reduce cravings so you are less tempted to snack in between meals. It is essential to find better ways to manage your emotions so you can overcome a habit of emotional overeating. Spencer outlines five ways to help you achieve this. It is also helpful to plan your meals one day in advance and prepare food before you get hungry. These strategies set you up to make positive choices while reducing the risk of potentially destructive impulse decisions. Steel-cut oats, quinoa, brown rice, sprouted whole grain bread, whole grain pasta, fresh fruit, vegetables, nuts, beans, soy products, eggs, fish, chicken breast, turkey, yogurt, olive oil, soy sauce, teriyaki sauce, herbs and spices. The Diet Dropout’s Guide to Natural Weight Loss says that just about any diet will bring about weight loss. But in order to keep the weight off you must exercise regularly. For basic health you need to do at least thirty minutes of moderate exercise, five or more days a week. However to maintain a healthy body weight it may be necessary to exercise for sixty minutes a day. Aerobic exercise burns calories but you can get extra weight loss benefits by boosting your metabolism with strength training. 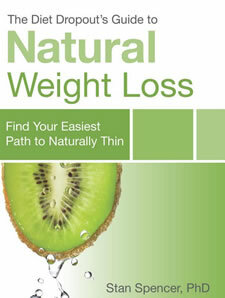 The Diet Dropout’s Guide to Natural Weight Loss: Find Your Easiest Path to Naturally Thin retails at $11.95. Click here to purchase this book for a discounted price or download the even cheaper Kindle version here. Advocates healthy lifestyle changes for a permanent weight loss solution. Encourages consumption of fresh fruit, vegetables, nuts and whole grains. Does not require calorie counting or measuring portions. Acknowledges the role of stress management and its connection to healthy eating habits. Will not appeal to dieters who prefer to follow a structured diet and exercise program. Weight loss results may take some time to become apparent. Does not include a meal plan and only provides a limited recipe selection. Some dieters will require more guidance to make optimal food choices for health and weight loss. Experts agree that the best way to lose weight and keep it off for good is to make lasting changes in your diet and exercise habits. The Diet Dropout’s Guide to Natural Weight Loss provides education and practical strategies to help you create your own personal weight loss plan. Ultimately this allows you to implement a healthy lifestyle solution for permanent weight loss.